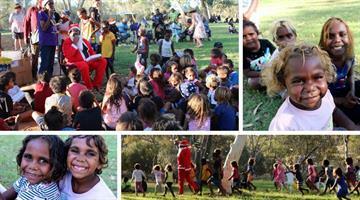 Children's Ground works with communities in Central Australia and the Top End of the Northern Territory. We walk alongside children and their families at the request of communities where there is a shared vision. Children’s Ground was conceived with community leaders in Alice Springs and designed to address the devastating experiences for many who live with profound inequity in Town Camps and the region. 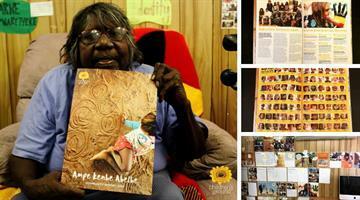 The unrelenting demands of Arrernte elders and families in central Australia - for a new approach, for greater respect and for control over their lives after decades of failed policies forced upon them - was the original inspiration behind Children's Ground. With families at each location, we are building a strategic plan that aligns with their vision and the cultural landscape, allowing us to build the conditions for future success. Children's Ground is beginning with a grassroots approach, focusing on family-led early years learning and employment of Arrernte people in the service design, delivery and evaluation. We are determined to bring back to the community a realisation of their aspirations and years of work to redress what we consider to be some of the greatest inequity, human rights abuses and childhood trauma arising from colonisation and continued ineffective policy and practice. We are encouraged by the engagement and desire from both the Australian and Northern Territory Government to bring about this change. Children’s Ground’s first partnership was with the Mirarr people in the Northern Territory, through their organisation the Gundjeihmi Aboriginal Corporation (GAC) and the Kakadu West Arnhem Social Trust (KWAST). 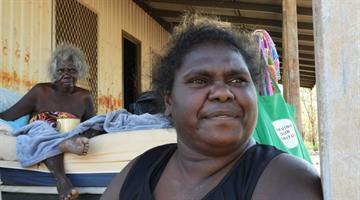 The Mirarr are the traditional custodians of an estate covering much of the north-east of Kakadu National Park, parts of Western Arnhem Land, and the lands comprising the Ranger Project Area, Jabiluka uranium lease and the town of Jabiru in the Northern Territory. The Children’s Ground program ceased in Kakadu West Arnhem on 30 June 2017. The core funding for the program had been provided by the local Mirarr traditional owners via the Kakadu West Arnhem Social Trust, also established by the Mirarr. Due to changed circumstances and priorities, the Mirarr were no longer in a position to fund and support the Children’s Ground program. Alternative local service providers are expected to continue key services and programs after 30 June 2017. While we are deeply sad that we can no longer continue to work with children and families in Kakadu, we know there is much to celebrate. In just a few years, we have witnessed the extraordinary things that happen when you place control back in the hands of the community. Children are engaged in a vibrant world of early years learning, families are engaged in meaningful employment and a community has mobilised around the future of their children. Families are building the foundations for their children to grow up feeling loved, strong and proud of who they are, and with the skills to choose whatever future they desire. We extend our deepest thanks to the Gundjeihmi Aboriginal Corporation, the Kakadu West Arnhem Social Trust, the Northern Territory and Commonwealth Governments, our philanthropic family, the Mirarr and to the Bininj people of Kakadu West Arnhem, for their partnership and support over the past few years. The Shared Office team are located in Melbourne. They are the critical strategic, financial and management team that underpin our work and provide the capacity to scale as a national organisation. The team travel regularly to the Top End and Central Australia and provide key direction and support in the areas of People and Culture (HR), Evaluation, Communications, Risk and Compliance, Policy and Finance. Shared administration, process, quality standards and evaluation frameworks provide economies of scale for Children’s Ground operations across locations, and experience gained from implementation in one community will inform service delivery in other communities.